Kiki’s birthday parties are always fun, playful and energetic. The kids all love to hula hoop, and parents look out, Kiki might get you in a hoop too! 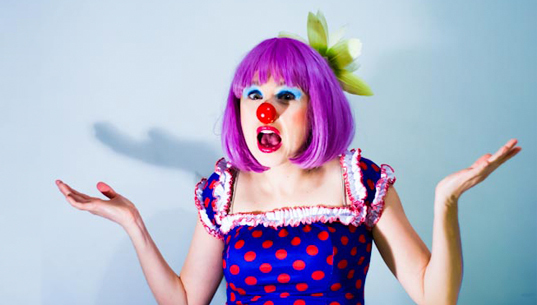 If you are thinking of having a character or a clown as part of your next event, Kiki the Clown would be perfect! She is fun, energetic and always has a smile on her face. Invite her to your next Birthday Party and she will perform her fabulous Kiki the Clown show (30 min show). This party is ideal for children ages 6-10. Kiki is coming to an event near you with her hula hoops, big skirts, and charming smile! With her big sister gone for the year, Kiki has decided to make it on her own, to create a solo show like a grown-up clown! Invite her to your party for giggles and surprises as she throws off her sidekick costume and steps into her unique, fun-loving self. Kiki has been performing since 2008 with her debut at the Edmonton International Street Performers Festival. Since then she has travelled across Canada and currently is performing all around Ontario. Kiki has entertained crowds at many birthday parties and also at the Port Credit Busker Festival, Toronto Buskerfest, Mississauga Waterfront Festival, Creemore Festival, Mississauga Pep Rally and many more. Kiki is the ideal to motivate a crowd or lead a parade! She is a fun, playful and energetic clown that loves hula hooping and getting into fun mischief. She’s happiest when traveling around the world, entertaining crowds and partying at festivals. She is perfect for all types of events from Birthday parties, parades, festivals or even corporate events!